The Max was conceived in 2011, after American Airlines had threatened to purchase a large number of aircraft from Airbus, which had made inroads against its U.S. rival by racking up over 1,000 orders in the prior half-year for its new fuel-efficient A320 (its 737 equivalent). By saving on fuel, a major operating expense in air transport, American sought to get a leg up on its own rivals, especially other U.S. carriers. The airline industry had just spent a decade slashing the “fixed cost” of labor to the bone, through bankruptcies, mergers and other full-throttle attacks on the unions. Boeing placed fuel-efficient engines on the Max that were bigger and heavier than those on previous 737s and thus had to be mounted higher and further forward to not scrape the ground while the plane taxied. The changed aerodynamics created a tendency to push the nose up, making the Max prone to stalls. The only safe solution would have been to redesign the airframe to match the engines. However, management opted for a cheap and quick patch, introducing new anti-stall flight-control software, MCAS. That substitute allowed Boeing to maintain the lie that the Max was not a new aircraft but a modification of the 737 in order to expedite its development, testing and certification. The ruse also gave an additional selling point to the airlines, with Boeing falsely claiming that the most minimal additional pilot training was needed to fly the aircraft. In the U.S., pilots received only one hour of training on an iPad, not on a simulator! The way management implemented MCAS greatly magnified the potential for disaster. Boeing rushed the Max out the door knowing it was a ticking time bomb, while concealing from pilots critical information about MCAS, not least how to respond in the event that it wrongly kicked in. Liberal commentators have sought to obscure the role of the FAA under Obama by talking up the “special relationship” between the Boeing CEO and Trump. Acting defense secretary Patrick Shanahan was a longtime Boeing executive, and acting FAA head Daniel Elwell used to work for Boeing’s trade association. But Boeing has long had a special relationship with both capitalist parties in Washington, D.C. In 2011, Barack Obama, having already bailed out Wall Street and U.S. automakers at the expense of the workers and poor, moved to restore Boeing’s flagging competitiveness. The president toured a number of Asian countries to sell the newly conceived Max and other Boeing aircraft and was on hand in Indonesia when Lion Air announced it was ordering over 200 of the Max. The next year, he commented: “Given the number of planes I have sold all over the world, I expect a gold watch after my departure.” Instead, Boeing received the parting gift as Obama showered it with over $30 billion in defense contracts on his way out of the White House. Boeing is the largest U.S. exporter and the world’s second-largest supplier of military hardware. The aerospace giant’s striving for hegemony in its branch of industry is emblematic of imperialism, the monopoly stage of capitalism in which the advanced powers vie with one another to redivide the world and control markets, as well as natural resources and cheap sources of labor, by force of arms when necessary. The FAA’s allegiance to Boeing reflects its very purpose: to protect the interests of U.S. monopoly capital in the industry it regulates. Not surprisingly, following the second crash the FAA kept the Max in the air even after all other countries had halted its operation. Notably, the Chinese authorities, who are not ruled by the profit motive, set things in motion by grounding the Max less than 24 hours after the second crash. By all indications, the Chinese bureaucratically deformed workers state has in recent years put a heavy emphasis on safety in its burgeoning airline industry. The current spectacle of bourgeois politicians huffing and puffing over air safety is pure hypocrisy. With a flurry of investigations and hearings now underway in the nation’s capital, the goal is nothing more than to give the FAA a clean bill of health, whether by providing a veneer of “independence,” or finding a scapegoat, or both. Meanwhile, Boeing has plans to release what it trumpets as a fix to the MCAS software, which cannot possibly compensate for the aircraft’s inherent aerodynamic instability. The two Max jets downed by the hunger for profits are a graphic illustration that coordinated union control of safety—in aviation, manufacturing and every other sector of the economy—is a matter of life and death. Union grounding of unsafe planes would get major blowback from the bosses; workers must be ready for class battle. Just over a month ago, Southwest Airlines filed suit against AMFA, the union representing its mechanics, for causing a “state of operational emergency” by writing safety assessments that took a larger number of aircraft out of service than deemed acceptable by management. The carrier, which also owns the world’s largest Max fleet, has sought to bust the union by further outsourcing maintenance work, provoking a now six-year-long contract dispute. Wringing more from workers and cutting corners on safety go hand in hand in the capitalist drive to maximize profits. It is crucial for the unions to organize independently of the government agencies and political parties of the class enemy. To Hell with “Boeing’s Best Interest”! Far from waging any kind of fightback, the bureaucrats sitting atop the unions are committed to the capitalist profit system and the program of class collaboration. This treachery to the working class is encapsulated in the lie of a partnership of labor and capital, as well as the embrace of false “friend of labor” Democrats and the peddling of “America first” protectionist poison. It is a searing indictment of various pilots union tops that they expressed “confidence” in the Max even after it was grounded elsewhere, willingly putting their own members, not to mention thousands of other people, in harm’s way. Marking another betrayal, these same bureaucrats had previously agreed to the non-training of pilots before flying the Max. The Max monstrosity should have been stopped on the drawing board. The current silence of the SPEEA Boeing engineers union leadership is deafening. Over the years, officials of the Boeing IAM Machinists union have justified their own surrender to the bosses by invoking “Boeing’s best interest,” part of viewing themselves as front-line defenders of U.S. “national interests” by producing military and civilian aircraft. In fact, the interests of Boeing and those of its workers cannot be reconciled. From the outset, Boeing’s plans to ram through Max production hinged on ensuring labor peace, for which the bosses enlisted the services of the union misleaders. Combative Machinists had gone on strike five times since 1977, including in 2008, shortly after the financial meltdown on Wall Street. That eight-week confrontation had ended in a draw, but management was not going to tolerate another go-round. In 2011, Boeing secretly reopened contract negotiations with the IAM tops one year before the contract expired, stoking fears of having the Max assembled at its non-union South Carolina plant instead of in Washington State, a maneuver that led to the acceptance of the contract extension. The IAM district president enthused over the deal, calling it “precedent setting,” and indeed it was. Two years later, the bosses, in cahoots with the union bureaucrats, again reopened the contract early under blackmail conditions, sparking a rank-and-file revolt that was defeated with the imposition of massive givebacks, including the gutting of pensions and a no-strike clause active until 2024. Anti-union attacks and trampling on safety have paid off handsomely for the massive firm. Boeing set company highs for revenue, cash flow and commercial aircraft deliveries in 2017, propelled by its new Max flagship. Last year, it shattered those records all over again. Despite a downtick over the last month, its stock shares have tripled in value since the end of 2016, the best return on the Dow Jones industrial average; its stock is up by more than 1,000 percent compared to a decade ago. Over much of the same period, between 2012 and 2018, Boeing has slashed some 34,000 jobs. The watershed in the ongoing capitalist offensive against the unions was also a frontal assault on air safety: the Reagan administration’s 1981 mass firing of striking PATCO air traffic controllers, whose main concerns were staffing shortages, antiquated equipment and job pressures that endangered passengers and flight crews. Already, as a result of airline deregulation under Democrat Jimmy Carter three years earlier, cutthroat competition in the industry was wreaking deadly havoc in the skies. Labor could have beaten back Reagan’s union-busters by shutting down the airports. A half-million-strong demonstration in D.C. at the time of the PATCO strike was a powerful display of the sentiment among union members to make a fight of it. But IAM president “Wimpy” Winpisinger, a leading member of the Democratic Socialists of America, and other AFL-CIO honchos did not even try, and instead had Machinists, pilots, flight attendants and Teamsters report to work. What is posed is a fight for a new leadership of the unions, one committed to a class-struggle program and outlook. Such a leadership would enforce through collective action the right of any worker to shut down hazardous worksites, including by grounding unsafe airplanes, and prepare the vitally necessary battles against the capitalist exploiters, from organizing the unorganized to the fight against black oppression and anti-immigrant bigotry. It would do everything to break down the divisions within the working class—by race, gender, country of origin, location, craft and company—and cement bonds of solidarity, both in the U.S. and internationally. The only way workers have ever won anything of value was by wielding their collective power, usually in defiance of anti-labor laws. In the course of such sharp struggle and through the intervention of Marxist militants, a workers party can be forged, one capable of arming the multiracial proletariat with an understanding of both its social power and its historic interest in sweeping away the capitalist order altogether. Boeing’s initial reaction to the Lion Air crash was typical of bosses everywhere: blame the workers. The manufacturer, oozing racist contempt for Indonesian pilots, claimed they should have known how to disable MCAS on the grounds that it is a so-called “memory item,” that is, a carryover procedure from earlier 737 models. Never mind that the anti-stall system was entirely new to the Max, and Boeing purposely did not notify pilots of its existence, much less inform them on how to deal with it. The Lion Air pilots spent their final seconds desperately searching through a Max manual to no avail; the only reference to MCAS in the main flight handbook is in the glossary. The MCAS system operates by automatically tilting the plane’s horizontal stabilizer to pitch the nose down when the software detects an impending nose-high stall, based on readings from what is known as an “angle of attack” (AOA) sensor. Black box data retrieved from the wreckage indicates that for both flights a faulty AOA sensor triggered MCAS multiple times, initiating a tug of war as the system repeatedly forced the nose of the plane down and the pilots wrestled with the controls to pull it back up—over 20 times in the case of the Lion Air flight. “Pitch up! Pitch up!” were the last recorded words of one of the Ethiopian Airlines pilots to the other. For decades, every Boeing aircraft has included two AOA sensors, one on either side of the fuselage. But company brass deliberately had MCAS configured to respond to the input of only one, a violation of the first and most basic principle of safe design: redundancy. AOA sensors have failed plenty over the years. For example, in 2014 an American-operated Boeing 767 had to return to Miami airport after takeoff to replace one. The Lion Air and Ethiopian Airlines pilots did not have the benefit of an alert to warn of the defective AOA sensor. Since Boeing designated this vital safety feature a luxury, high-priced extra, both these airlines had declined to purchase it. This “nickel and dime” approach to safety is surely familiar to passengers, who are today charged for every supposed perk, including a few inches of leg room, in planes whose coach sections are packed like cattle cars. 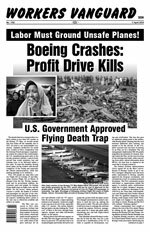 In a muckraking article by Dominic Gates in the Seattle Times (21 March), Boeing engineers who performed the original MCAS safety analysis on behalf of the FAA blew the whistle to him on Boeing’s cover-up. Among their findings: MCAS was capable of moving the horizontal stabilizer more than four times farther than Boeing claimed, making it more difficult to recover from a dive; the system reactivated each time a pilot tried to make a correction; and the consequences of a system failure were severe enough that activation by only one sensor should have been ruled out. None of these issues were fixed and the FAA certified MCAS, just as Boeing expected of its government partners. For an Internationally Planned Socialist Economy! The disastrous performance of the MCAS system has cast a pall over aircraft automation for some pilots and industry observers. But automation is integral to modern air travel, having provided significant safety advances over the years, from the early, century-old autopilots to today’s fly-by-wire electronic interfaces. Automation done right has proven to be of huge benefit to pilots and passengers. But software will only prevent crashes anticipated by engineers. Automation is not a substitute for human flight control, especially in emergencies. No machine would have done what Captain “Sully” Sullenberger did with his A320 in the 2009 “Miracle on the Hudson.” Sully also symbolizes the plight of this country’s airline workers: his employer, US Airways, had slashed his pay by 40 percent and dumped his pension. Many new hires at cut-rate outfits barely make poverty wages. The fight for quality pilot training, as well as for decent pay and benefits, is essential to safe skies. Automation is only as good as the aircraft’s mechanical components and the maintenance practices of the airlines. This was shown in the crash of an Airbus A330, Air France Flight 447, on 1 June 2009, that killed all 228 people on board when the plane’s pitot tubes (air speed sensors) iced over, turning off some flight automation and making the pilots scramble. Safety is no closer to “first” at Boeing’s European competitor: Airbus knew for over a year of the problems with this model of pitot tube, and Air France had kept its A330s flying even though the faulty parts hadn’t yet been replaced. The problem is not automation or technology as such, but the economic system. Boeing and Airbus workers make sophisticated machines of great social value, which airline workers then operate and maintain. But as wage slaves, all their blood and sweat goes toward making profit for the tiny class of capitalist exploiters who own the means of production and finance. The airline industry is a concentrated expression of the irrationality of this system, which results in fiery disasters, crumbling infrastructure and widespread misery. The productive wealth of the entire society must be ripped from the grip of its private owners, liberating production from the profit motive. Only after a series of workers revolutions across the globe, paving the way for an international planned socialist economy, will air transport truly serve human need and help transform the disparate nations of the world into a genuine community of equals.